The Virginia Creeper Trail stretches 34 miles from Abingdon, VA through Damascus, VA to the NC stateline near Whitetop, VA. It began as a native american footpath. Later the European Pioneers, as well as early explorer Daniel Boone, used the trail. Shortly after 1900, W.B. Mingea constructed the Virginia-Carolina Railroad from Abingdon to Damascus. In 1905, the Hassinger Lumber Company extended the line to Konnarock and Elkland, NC. In it's day, the line hauled lumber, iron ore, supplies and passengers. It got it's nickname, "Virginia Creeper", from the early steam locomotives that struggled slowly up the railroad's steep grades. The Virginia Creeper Trail, a cinder and crushed gravel trail, travels through some of the most rugged and beautiful scenery in the Eastern United States! Many believe it to be one of the most picturesque rail-trails in the country! 1. How far is the ride from Whitetop to Damascus? 17 miles, almost all downhill. You'll have to pedal the last 3 miles as it flattens out a bit. From 2 1/2 to 3 hours depending on how fast you ride. We suggest that you take your time because there are many places to stop and take in the scenery. 3. Is there water, food and restrooms along the trail? Yes, there are vault toilets at numerous places including the trailhead at Whitetop. There is water available (seasonal) at Green Cove. There is The Creeper Trail Cafe, a nice little cafe at Taylor's Valley, about 10 miles down, that you can stop and have lunch at as well as many places to eat in Damascus. $15.00 for the shuttle to Whitetop if you bring your own bike, or you can rent a bike from us and shuttle for $26.00 + tax. Visit our Rates page for more information on cost for your ride. 5. What about group rates? Yes, we have group rates. Groups of 10 or more receive a special discount. Please call to inquire. 6. What are your shuttle times? Weekends - Shuttles leave at 8 A.M., 9:30 A.M., 11:00 A.M., 12:30 P.M., 2:00 P.M., and 3:30 P.M.
7. What is the surface of the Virginia Creeper Trail like? Crushed limestone and cinders left over from the train days. Hard packed in most places. 8. Is it a strenuous ride? Nope, even people who haven't ridden in years can do this ride. That's what makes is so great! 8:00 A.M. to 6 P.M. on the weekend. 10. Do cell phones work on the Virginia Creeper Trail? Not on the upper section. They sometimes work on the Abingdon to Damascus section depending on your carrier. Damascus has service provided by Sprint. 11. Is a helmet required? Not required but highly recommended! 12. What is the elevation at Whitetop vs. Damascus? The Whitetop elevation is about 3500 feet and Damascus is about 1910 feet. That's almost a 1600 foot drop over 17 miles. 13. Can I ride my bike up to Whitetop? Yes. The grade does not exceed 5%. 14. Is there camping allowed on the Creeper Trail? How about other camping? Camping along the trail is fine as long as it's not on private property. The US Forest Service/Mt Rogers National Recreation Area also maintains some nice campgrounds. 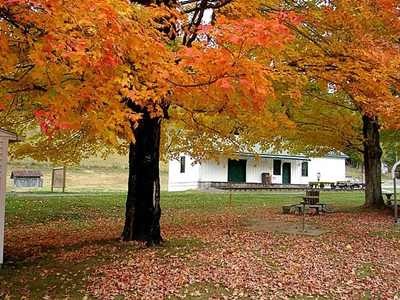 To learn more visit the Mount Rogers National Recreational Area site. 15. What about other lodging options in the Area? See our Attractions, Food, and Lodging page to find other places to stay while you're visiting the Damascus and Abingdon area. 16. What does the Virginia Creeper Trail look like? To view photos, visit our Photo Gallery.